Join Us for African Heritage & Health Week Feb 1st - 7th! Each year, Oldways begins Black History Month by helping communities celebrate the healthy foods and cuisines of African heritage with African Heritage & Health Week. Celebrated February 1st-7th, African Heritage & Health Week commemorates the flavors and healthy cooking techniques that were core to the wellbeing of African ancestors from Africa, South America, the Caribbean, and the American South. February is the perfect time to honor and explore this healthy culinary history. 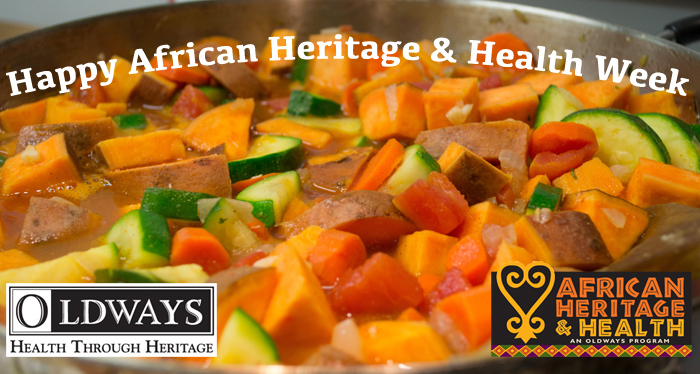 Each year, Oldways begins Black History Month by helping communities celebrate the healthy foods and cuisines of African heritage with African Heritage & Health Week. Celebrated February 1st-7th, African Heritage & Health Week commemorates the ﬂavors and healthy cooking techniques that were core to the wellbeing of African ancestors from Africa, South America, the Caribbean, and the American South. February is the perfect time to honor and explore this healthy culinary history. African Heritage & Health Week was designed to raise awareness about the health beneﬁts and exciting ﬂavors of traditional African heritage cuisines, and to invite people everywhere to taste these traditional foods, whether at a restaurant, a special community event, or at home with friends and family. Oldways invites you to join the African Heritage & Health Week celebration by coordinating your own unique gathering in your local community! Schedule a potluck party the week of Feb. 1-7. Invite your friends and family to your home or a community space for an African heritage potluck lunch or dinner. Ask each guest to do a little homework and to bring a healthy traditional dish with African roots. Encourage them to browse through Oldways’ African Heritage Diet recipes for cooking inspiration, like Oldways’ Callaloo Soup (a savory leafy greens stew from the Caribbean) or Accara (golden black-eyed pea fritters found in West Africa). Request a complimentary African Heritage Diet Pyramid from Oldways to hang up at your party. Invite a group to join you for dinner at a local African Restaurant the week of Feb. 1-7. Call and make a reservation and let the restaurant know why you are coming. They may want to celebrate this special week too and share the news with other patrons. And don’t forget to look at our African Heritage Dine Around page for restaurant recommendations in all 50 states. If there is a restaurant in your town that is not on our list please let us know and we will be sure to add it. Print or request African Heritage Diet 101 Brochures to distribute materials at your workplace, church, library, local grocery store, or school. If you’re comfortable talking in front of a group, give a short presentation about the African Heritage Diet Pyramid using Oldways’ resources and free Continuing Education Course. Check out our List of 2015 Events to ﬁnd events are already happening near you! Get Social: If you belong to social networks we encourage you to share news about African Heritage & Health Week in your online communities. Please use the hashtag #AfricanHeritage and don’t forget to connect with Oldways on Facebook, Twitter and Pinterest. Donate to the African Heritage & Health programs, to help bring culturally-inspired nutrition education to more communities! Other ideas? Tell us what you are thinking! Email Program Manager Sarah McMackin at sarahm@oldwayspt.org for questions, event announcements, and/or material requests. Oldways is happy to send African Heritage brochures and/or posters to bring the celebration to life and help all that attend learn more about African Heritage cuisine. Share Your Photos: We love being able to see how diﬀerent communities celebrate African Heritage & Health Week through photos! Snap some shots of your group enjoying their favorite dishes, and we’ll feature them on our African Heritage & Health Week List of 2015 Events. We look forward to celebrating African Heritage & Health Week with you and your community!